Very Good. Gods of Gold: A New Police Procedural Series Set in Late Nineteenth Century Leeds (A Det. Insp. Tom Harper Mystery) by Nickson, Chris, 2014-07-30. Sewn binding. With printed dust jacket. 224 p. A Det. Insp. Tom Harper Mystery , 1. Very Good. 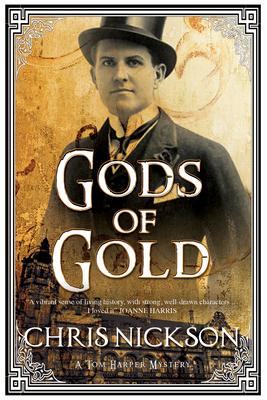 Gods of Gold: A new police procedural series set in late nineteenth century Leeds (A Det. Insp. Tom Harper Mystery) by Nickson, Chris, 2015-02-27. Trade paperback (US). Glued binding. 224 p. Det. Insp. Tom Harper Mystery, 1.